Moving with the times is absolutely imperative. Today the world is becoming modernized at supersonic speed. Anything old is passé. Nobody has taste for things that belong to a bygone era and find little relevance in the modern times we are living in. Same is true for names too. Modern Indian Baby Names are the choice of the day. When your family grows and you become parents to a precious new life, you want your little one to fly high in the sky with all the in things you can provide him/her with. So the name you give the angel must also be a happening one. A trendy name, easily rolled out from the tongue, in keeping with the choice of the internet generation is the ideal choice for you. Staying out of india? 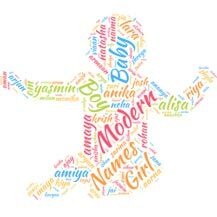 You probably are looking for baby names which are modern, stylish and at the same time easy to pronounce. We've hand picked few modern and easy to pronounce Indian baby names to help you make the decision.